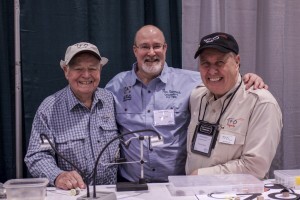 I had a couple of VIPs stop by the booth for a visit at the show, Lefty Kreh and Ed Jaworowski. I would be hard pressed to name two people better at casting instruction. As I can always use help with my casting, but were unable to convince them to come home with me, I picked up a copy of their DVD ‘The Complete Cast’. Finally there will be something worth watching on tv.